In medium bowl, mix 1 cup flour and the salt. Cut in shortening, using pastry blender (or pulling 2 table knives through ingredients in opposite directions), until particles are size of small peas. Sprinkle with cold water, 1 tablespoon at a time, tossing with fork until all flour is moistened and pastry almost leaves side of bowl (1 to 2 teaspoons more water can be added if necessary). Gather pastry into a ball. Shape into flattened round on lightly floured surface. Wrap flattened round of pastry in plastic wrap, and refrigerate about 45 minutes or until dough is firm and cold, yet pliable. This allows the shortening to become slightly firm, which helps make the baked pastry more flaky. If refrigerated longer, let pastry soften slightly before rolling. Heat oven to 400°F. On surface sprinkled with flour, using floured rolling pin, roll pastry dough into circle 2 inches larger than 9-inch pie plate. Fold pastry into fourths; place in pie plate. Unfold and ease into plate, pressing firmly against bottom and side and being careful not to stretch pastry, which will cause it to shrink when baked. Trim overhanging edge of pastry 1 inch from rim of pie plate. Fold and roll pastry under, even with plate; flute as desired. In large bowl, toss Filling ingredients. Pour into pie plate, mounding apples toward center. In medium bowl, use pastry blender or fingers to mix butter, 1 cup flour and the brown sugar until a crumb forms. Sprinkle evenly over top of pie. Sprinkle 1 tablespoon granulated sugar on top. Bake 45 to 55 minutes or until pie crust and crumb topping are deep golden brown and filling begins to bubble. Transfer to cooling rack to cool. Feel free to swap in a refrigerated rolled pie pastry for the bottom crust if scratch pastry making isn’t your thing. We recommend Pillsbury brand. Choose crisp and tartly-sweet apples—consider Empire, Granny Smith, Honey Crisp, Braeburn, Cortland—as they hold their shape and aren’t too juicy. Serve pie warm or room temperature with fresh whipped cream or a scoop of ice cream on top. Pie will keep frozen, wrapped in plastic wrap and foil, up to 3 months. What makes a “Dutch” pie? The streusel topping, a nearly irresistible, crunchy sweet mixture of sugar, butter, flour, and nuts, probably comes from other Germanic-styles of baking. It’s a simpler finish for not only a pie but for coffee cakes, muffins, and bar cookies. Feel free to add a small spoonful of ground spice—cinnamon or an apple pie spice blend. Dutch apple pie, called appelkruimeltaart, has been a dessert favorite since as far back as the Middle Ages. There’s even a written recipe for it that appears in a Dutch cookbook from 1514, Een notabel boecxken van cokeryen ("A notable little cookery book"). If you’re ready to learn more about time-tested traditions—and brand-new techniques—for baking apple pie, check out Betty’s apple pie guide. Once your pie is out of the oven and cooled, you’ll have to decide how you’d like to top your pastry masterpiece. 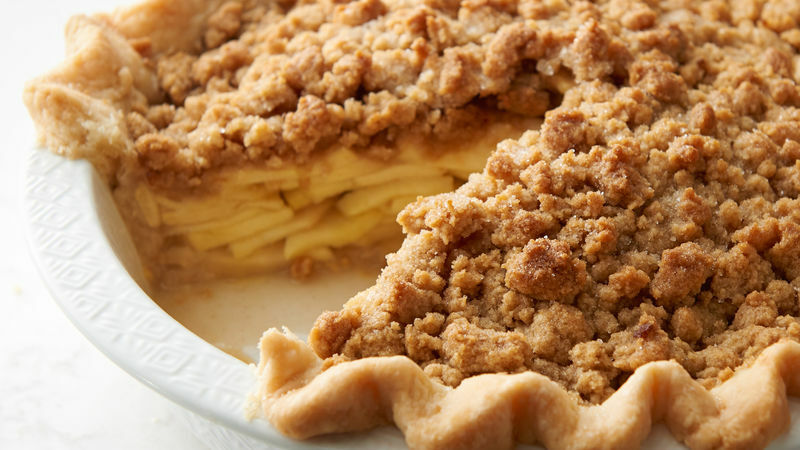 While the most popular toppings for apple crumble pie are whipped cream or vanilla ice cream, there are those who swear that no serving of apple pie is complete without a slice of cheddar cheese on top. They abide by the old saying: “An apple pie without the cheese is like a kiss without the squeeze.” Once you’ve tried this Dutch apple pie recipe, consider some of the recipe variations in Betty's best apple pies collection.